Today, I want to try something unusual: I want to analyze the story of Noah from a literary perspective. Some surprises lurk beneath the surface. Ready to begin? Okay. See you soon! Welcome back. Keep that tab open. Your “test” begins now! How many animals were brought onto the ark? Take some time to formulate your own answer. Now, if you go Google-fishing for “Bible contradictions”, most of your results will reside at a quality bar similar to Youtube comments. Fortunately, we don’t have to dredge through the mud. Our point here is pre-controversial: there exists a tension in the narrative; a wound that some seek to heal, others to excise. That tension explains the controversy. Another hard question. Take your best guess. Again, the point here is about tension. Notice your confusion. How was the narrative flow? Yes, the narrative had structure. Yes, its plot holds together. But was it a pleasure to read? Well, I didn’t think so. To most modern readers, perhaps, the level of detail is painful, the amount of repetition tiresome. What are we to make of this? Are we to judge the story’s author as less enlightened regarding narrative structure? A typical counter-argument goes like this: such a move feels presumptuous. Narratives were constructed in a cultural context, and translating from a modern context to this “distant umwelt” is non-trivial. (Be careful, though: be wary of ignorance becoming a fully general counterargument). What is the point-of-view of the author? Could you create a compelling answer to this question, dear reader? I’m not sure if I could. My answer would be vague, and would lean heavily on the contents of story itself. Okay, so we’ve identified a few points of discomfort within the story. If we modify our beliefs about how it was constructed, can we better explain our confusion? As an aside: I want you thinking about how we could automate this “highlighter procedure”. 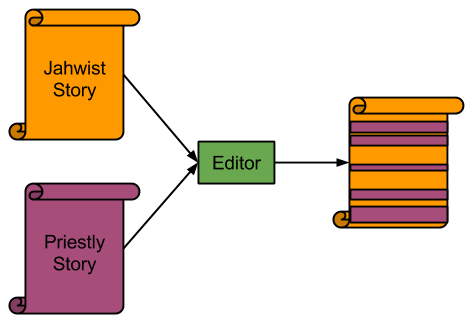 Could we teach a computer how to reconstruct multiple authorship, if and only if such blending had occurred? How would we make it learn the process? How could we test it? Okay, time to name the authors. The author of the orange text we shall call J: the Jahwist source (because he likes to use the YHWH title). The author of the pink text we shall call P: the Priestly source (for reasons I’ll explain in my next article). Imagine for a moment I successfully clone myself, and my clone participates in National Novel Writing Month (NaNoWriMo). If I were to publish my novel to this blog, do you think you’d be able to perform the above highlighting trick? Could you carve my novel into two pieces, and preserve the macrostructure and coherence of both halves? Most likely not, which points to the impressive nature of the trick we just pulled. Let H1 represent the original, one-author hypothesis. Let H2 represent the new, two-author hypothesis. Like good little Bayesians, we have H1 and H2 floating around in our mental apparatus. Let us now update these two “hypothesis bars”. Keeping the last excerpt open for easy reference, let us now revisit our “quiz” in light of H2. Q: How many animals were brought onto the ark? The Jahwist narrative has the rule: 7 pairs for clean animals, 1 pair for unclean animals. The Priestly narrative has the rule: 1 pair of all living creatures. Q: How long did the flood last? The Jahwist narrative has the flood lasting for 40 days. The Priestly narrative has the flood lasting for 150 days. Q: How would you rate the narrative flow? You’ve read the before and after… it’s a lot better! There is a counter-argument here, though, that I should not neglect. Perhaps the biggest reason we like H2 is simply in virtue of their length: cut any essay in half, and it becomes more pleasant to read (this article being the one exception! :P) This counter-argument has some weight… but does it strike you as more convincing than the removal of the above redundancies? Q: How well can you make out the author’s point-of-view? P only uses the more universal term God (16 times). J uses the more personal YHWH exclusively (10 times). P is interested in details such as ark dimensions, and lineages (only he names the sons of Noah). J is more oriented around the events. P uses very precise dates, reminiscent of a calendar. J uses the numeric theme of 7 and 40. Stylistically, P reads like the work of a scribe. J reads like an epic saga, like the Epic of Gilgamesh. In light of the above, it seems reasonable to claim that H2 is more likely to be correct. Do you agree? One common problem with such agreement-seeking emerges here: your expertise is (probably) not in literature, and you don’t fully trust your ability to evaluate my arguments. 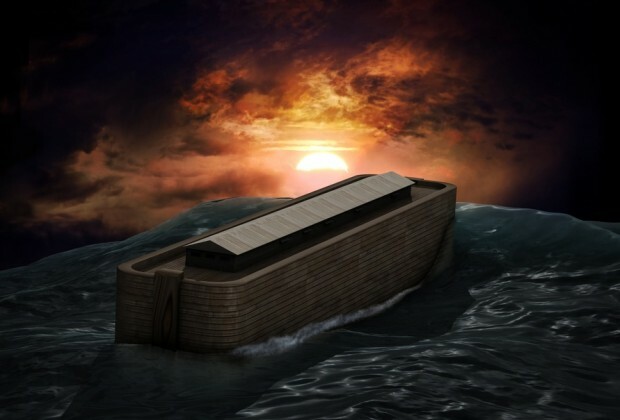 The multiple authorship solution to the story of Noah (H2) is the consensus of modern academia. It is not a contentious issue. That this consensus is not public knowledge to those who would like to know is a rather interesting cultural failure mode. But I probably don’t have the space to address science-culture barriers here. Counterfactual history is really fun. I wonder how knowledge of multiple authorship would have affected the canonization debates in the early Christian church. The fight over “contradictions” debates about the Bible might benefit from the following distinction: between-source, and within-source tension. The two “alleged contradictions” we saw today are clearly between-source. It seems long overdue for resources like BibleGateway to offer different versions of authorship highlighting, just as they do for translation options. Next time, I will be immersing this example of multiple authorship inference within the context of the Documentary Hypothesis and the modern atmosphere of Biblical studies. See you then! During the construction of this article, I drew from this textbook and this UPenn resource. Nice article, and a good summary of the two-source view. As far as your counterfactual goes, I’m pretty sure the accepted view in the Catholic church (if I recall, dating back to the Church fathers, possibly accepted even before then among Jewish audiences) was that the early books of the Bible are comprised of quite a range of source material. The simplest way to tell is to look at the genealogies — they’re clearly written in the same style, so it’s not hard to imagine they were added to the narrative by scribes working from official documents. The usual hypothesis for who wrote and who compiled the bulk of the OT are 1) Moses and 2) Ezra, though I’m not entirely sure which parts and books are credited to either one. If I recall correctly, Moses usually gets the lion’s share of credit for the Torah, while Ezra gets credit for the histories (Joshua through Kings). 1 and 2 Chronicles don’t really call for a compiler, given that they’re pretty straightforward records of the court of early kings of Israel and Judah. If you’re going to continue this sort of analysis, I’d love to hear your thoughts on the Syncretic Gospels (Matthew, Mark, and Luke). For a while the consensus has been that Mark came first (along with the Gospel of Q), but I find the argument for Matthean primacy far more convincing — essentially, Matthew came first, then Mark borrowed from him and from Peter (whose sermons were the basis of the ‘Q’ sayings. Luke came last, borrowing from both sources, possibly along with other material from Peter). Regardless, I’d love to debate this some more. > As far as your counterfactual goes, I’m pretty sure the accepted view in the Catholic church was that the early books of the Bible are comprised of quite a range of source material. Even if you’re right, though, my counterfactual is non-trivial: because the view of the Church then contains less information than what we know now (n>1 vs line-by-line source divisions). Imagine that, in 20 years, machine learning algorithms produce a source division hypothesis with evidence strong enough to bring the field of Biblical Studies into consensus. Now hand the early church these “definitively-highlighted Bibles”. In this scenario, I suspect some of the canonization debates would have moved from book-level to source-level. Do you agree? Even if we back away from Mosaic authorship, this seems incorrect: the evidence suggests that Deuteronomy was penned during the reign of King Josiah (~620 BC). > In this scenario, I suspect some of the canonization debates would have moved from book-level to source-level. I suspect you’re approaching the matter from an evangelical Protestant POV in which the Bible is treated as authoritative (often considered inerrant) on its own merits as the Word of God, whereas the Catholic and Orthodox understanding (which I’d argue is much more representative of the councils themselves) is that the OT and NT books of the Bible are authoritative because they represent the voice of God speaking through the people of God (in other words, it’s a difference between ‘infallibility of Scripture’ and ‘infallibility of the Church = communion of saints’). Thus, for Catholics and Protestants, it’s less important who composed the Scriptures out of what sources, and more important whether the finished product was regarded as authoritative and binding for the Jewish people or the Christian faith. Not saying it wouldn’t be interesting; just that you’d find far fewer butterflies than you might expect. > …the evidence suggests that Deuteronomy was penned during the reign of King Josiah (~620 BC). Not disagreeing with you, but Deuteronomy is basically a record of Moses’ death: the bulk of it is occupied by his final speech to the children of Israel. Hence, the text itself should be enough to tell us that he could not have written it. The usual presumption is that it’s either a record of the speech transcribed later, or that the speech was merely a compilation of various speeches and rulings Moses had made over the course of his life, similar to the ‘Sermon on the Mount’ in Matthew (which clumps a lot of different speeches made by Jesus into five *big* speeches spaced evenly across the span of his ministry. It wouldn’t surprise me at all if King Josiah were the one to commission the final text of Deuteronomy, given the fact that it was during Josiah’s reign that those books were rediscovered and publicly read (the Torah having fallen into obscurity and presumable disrepair during the idol-worshiping regimes of earlier kings). >I would love to eyeball the strong arguments you’ve encountered. 1) The argument for Markan priority often seems to rely on the argument that the simplest (least organized and least content-full) Gospel must have been first. The presumption is that the content in Matthew and Luke were added by later authors, who were not witnesses. This is why Markan priority came to the fore around the same time as arguments that the Gospels were really written a generation or two after Christ’s death. 2) Matthean priority, on the other hand, was the consensus view of the Church from the days of the earliest Church fathers — the best and earliest sources we have all corroborate this. Matthean priority is also indicated by its style, as the book of Matthew is very much framed in the context of Jewish literature. For instance, Matthew frequently points out how the life of Jesus fulfills some OT prophecy or other, Jesus frequently discusses subtle points of Jewish Scripture or debates with other religious leaders, the whole story is written in a particularly Jewish style (the five major speeches corresponding to periods of his life). In contrast, the other synoptic Gospels are framed and organized in a style much more familiar to Hellenic audiences (of Asia, Greece and Rome) — Mark has more of a didactic or public-speaking sort of style, while Luke is much more focused on historicity and biography. There are other arguments, but those are the ones I best remember. Saw this linked in a Catholic discussion forum re: the Matthew v. Mark debate. A good summary of the Clementine tradition (arguing for a Matthew – Luke – Mark order to the writing), and the first chapter provides an excellent illustration of what I meant when I referred to Mark’s style. The author ‘Mark’ is usually connected to the John Mark from Acts, who was an early companion and later scribe / interpreter for Peter when he went to preach in Rome. This explains why certain details in Mark sound like eyewitness testimony, because (by this account) it was transcribed from a speech given from that eyewitness.